'Equities' is just an 8 letter word. At the same time, the amount of theories, concepts and scenarios associated with it are many. So, investors have a number of queries related to investing in equities. The top most being, "How and where do I allocate my money in equities so as to get the best results?" Usually, brokers are of little help, spouting some well rehearsed statements involving jargon and heavy words. Well meaning friends too, do not always end up giving a crystal clear picture. Equitymaster's Asset Allocation guide is an effort to highlight the various factors influencing asset allocation in equities. In this guide, we will have a look at how best to allocate your equity investments so as to achieve optimum returns from them. We are certain that you will find this guide useful. We encourage you to share your thoughts and feedback on this guide on asset allocation in equities. We recommend that investors should decide their exposure to equities, which is only one part of the overall investment portfolio, after they have kept aside some cash. While we are no experts in wealth management, we believe keeping aside some safe cash is absolutely necessary. Not only will this cash take care of your liquidity needs, but it will also come handy during market declines. Particularly when there will be opportunities to pick up fundamentally strong stocks at cheap valuations. For some of you this cash component could be 6 months of usual monthly expenditure, for others 36 months. You need to decide what amount works for you, and then set it aside. Maybe in a FD, or in a pure liquid fund. Or maybe just cash at home! Equitymaster talks about what it means by 'asset allocation' with regards to a stock portfolio and how you can draw up the ideal asset allocation plan. In this article we get into the more specific aspects of building a portfolio that fits your needs, and guide you on planning your asset allocation. In this article we discuss basics of investing, understanding market capitalisation and allocation between large cap, mid cap and small cap stocks. 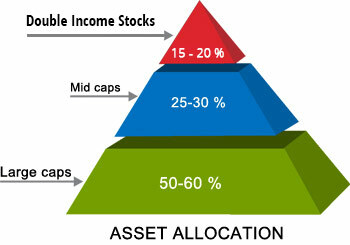 In your view, does asset allocation help? Tell us!